Operated by a group of developers, entrepreneurs and designers, KISSmetrics is devoted to helping businesses grow. The group has a strong background in web analytics for high-end sites. Based in San Francisco, KISSmetrics sells state-of-the-art customer analytics software engineered for small to mid-sized companies. Since its launch in 2008, the company has gained thousands of customers. KISSmetrics offers subscription services that can have server message blocks (SMBs) up and running in minutes. The plans are free for 14 days, and can then be downgraded, cancelled or upgraded. KISSmetrics surpasses the competition by telling you who has visited the site, in addition to what they did. It eliminates the need for different analytics solutions for Facebook, mobile and other applications. KISSmetrics can track a fixed or mobile website, mobile applications and web applications and then tie that information into one view. KISSmetrics analyzes and tracks much more than bounce rates. It focuses on customer value, revenue, conversion rates and marketing attribution, and provides businesses with the information to improve their bottom line. 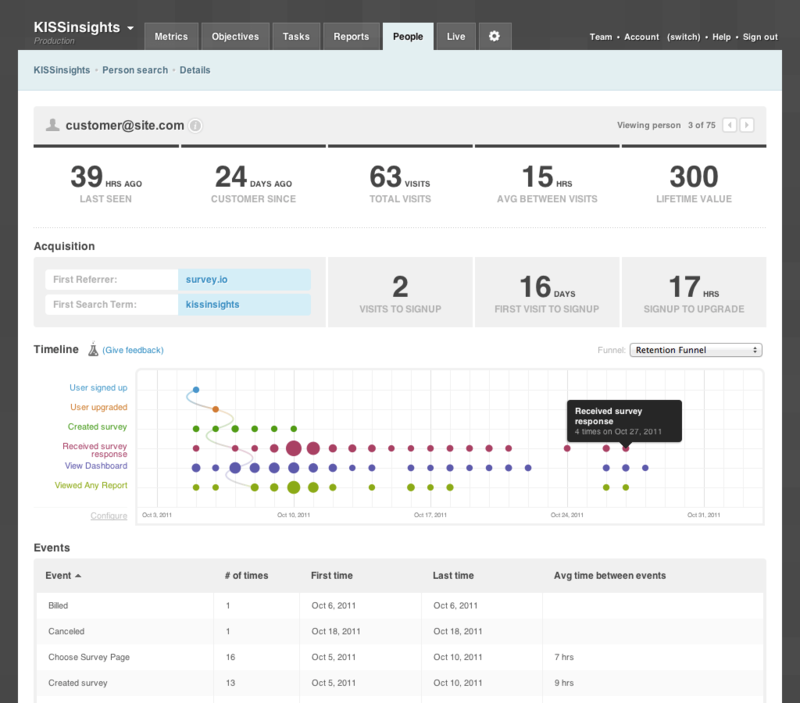 With KISSmetrics, you will track more data than ever. With online customers, you learn who they are instead of just knowing the events and visits to your site. You can now get a list of real people by entering criteria that is relevant to you. All the report features expected from web analytics are available to you. You can find out what’s preventing people from getting to the next step by running KISSmetrics and generating a list of people that didn’t take the next step. KISSmetrics can also tell you which customers’ behaviors have changed over time. There is so much flexibility available in this platform. KISSmetrics will maximize your marketing and allow you to understand how to increase your profits. Learn everything you need to know about KISSmetrics. Our experts will reach out to you shortly.